The kidneys, illustrated in Figure 1, are a pair of bean-shaped structures that are located just below and posterior to the liver in the peritoneal cavity. 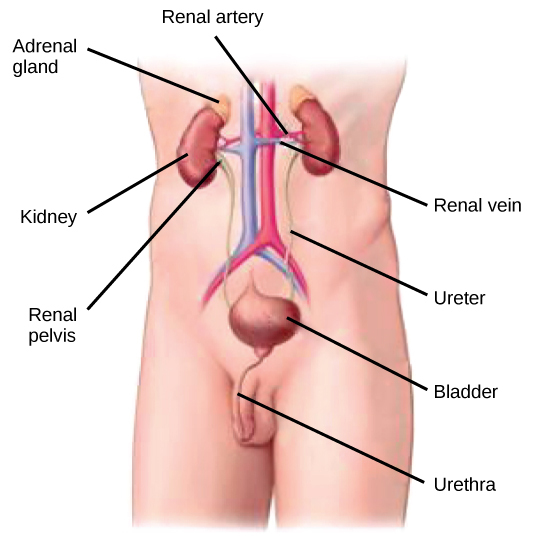 The adrenal glands sit on top of each kidney and are also called the suprarenal glands. Kidneys filter blood and purify it. All the blood in the human body is filtered many times a day by the kidneys; these organs use up almost 25 percent of the oxygen absorbed through the lungs to perform this function. Oxygen allows the kidney cells to efficiently manufacture chemical energy in the form of ATP through aerobic respiration. The filtrate coming out of the kidneys is called urine. 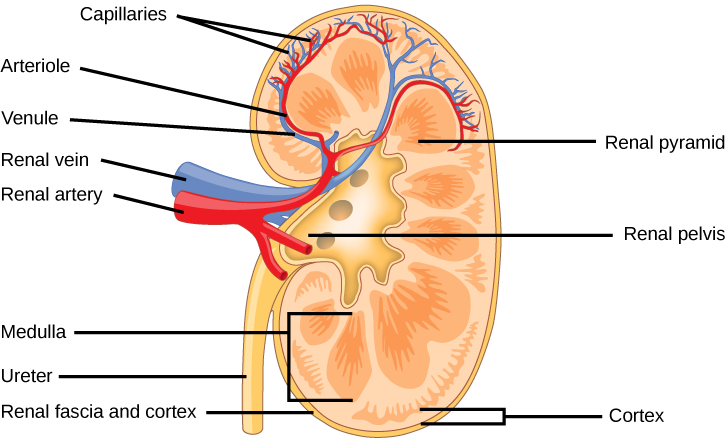 Externally, the kidneys are surrounded by three layers, illustrated in Figure 2. The outermost layer is a tough connective tissue layer called the renal fascia. The second layer is called the perirenal fat capsule, which helps anchor the kidneys in place. The third and innermost layer is the renal capsule. Internally, the kidney has three regions—an outer cortex, a medulla in the middle, and the renal pelvis in the region called the hilum of the kidney. The hilum is the concave part of the bean-shape where blood vessels and nerves enter and exit the kidney; it is also the point of exit for the ureters. The renal cortex is granular due to the presence of nephrons—the functional unit of the kidney. The medulla consists of multiple pyramidal tissue masses, called the renal pyramids. In between the pyramids are spaces called renal columns through which the blood vessels pass. The tips of the pyramids, called renal papillae, point toward the renal pelvis. There are, on average, eight renal pyramids in each kidney. The renal pyramids along with the adjoining cortical region are called the lobes of the kidney. The renal pelvis leads to the ureter on the outside of the kidney. On the inside of the kidney, the renal pelvis branches out into two or three extensions called the major calyces, which further branch into the minor calyces. The ureters are urine-bearing tubes that exit the kidney and empty into the urinary bladder. 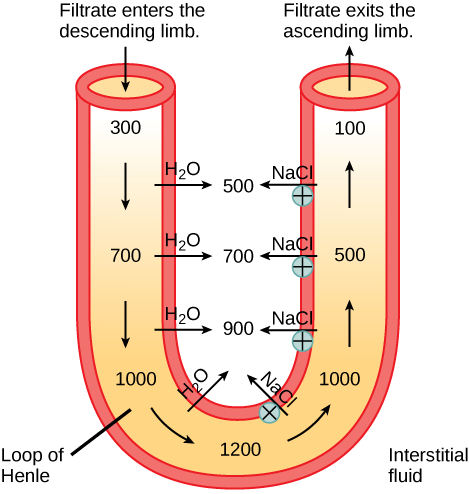 As mentioned previously, the functional unit of the kidney is the nephron, illustrated in Figure 3. Each kidney is made up of over one million nephrons that dot the renal cortex, giving it a granular appearance when sectioned sagittally. There are two types of nephrons—cortical nephrons (85 percent), which are deep in the renal cortex, and juxtamedullary nephrons (15 percent), which lie in the renal cortex close to the renal medulla. A nephron consists of three parts—a renal corpuscle, a renal tubule, and the associated capillary network, which originates from the cortical radiate arteries. Kidneys filter blood in a three-step process. First, the nephrons filter blood that runs through the capillary network in the glomerulus. Almost all solutes, except for proteins, are filtered out into the glomerulus by a process called glomerular filtration. Second, the filtrate is collected in the renal tubules. Most of the solutes get reabsorbed in the PCT by a process called tubular reabsorption. In the loop of Henle, the filtrate continues to exchange solutes and water with the renal medulla and the peritubular capillary network. Water is also reabsorbed during this step. Then, additional solutes and wastes are secreted into the kidney tubules during tubular secretion, which is, in essence, the opposite process to tubular reabsorption. The collecting ducts collect filtrate coming from the nephrons and fuse in the medullary papillae. From here, the papillae deliver the filtrate, now called urine, into the minor calyces that eventually connect to the ureters through the renal pelvis. This entire process is illustrated in Figure 4. Figure 4. 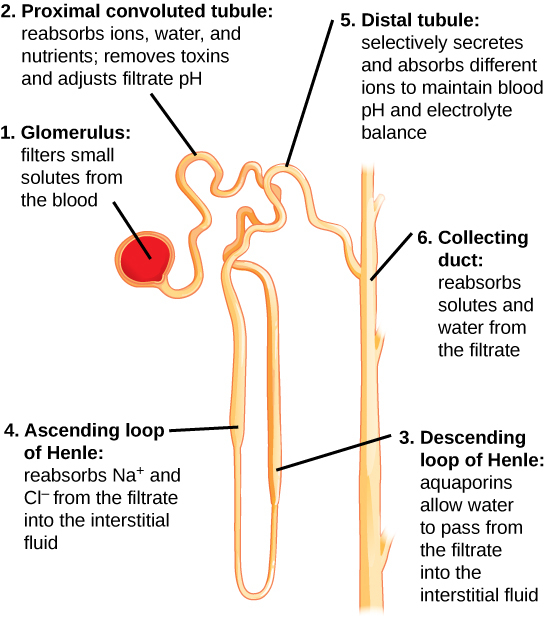 A diagram of the nephron. In the loop of Henle, the permeability of the membrane changes. The descending limb is permeable to water, not solutes; the opposite is true for the ascending limb. Additionally, the loop of Henle invades the renal medulla, which is naturally high in salt concentration and tends to absorb water from the renal tubule and concentrate the filtrate. The osmotic gradient increases as it moves deeper into the medulla. Because two sides of the loop of Henle perform opposing functions, as illustrated in Figure 5, it acts as a countercurrent multiplier. The vasa recta around it acts as the countercurrent exchanger. Figure 5. The loop of Henle. Loop diuretics are drugs sometimes used to treat hypertension. These drugs inhibit the reabsorption of Na+ and Cl− ions by the ascending limb of the loop of Henle. A side effect is that they increase urination. Why do you think this is the case?